The Caribou Room is a spacious classroom size area that can accommodate a variety of events. The Caribou Room may be used for workshops, business meetings, educational and classroom space, and program events. 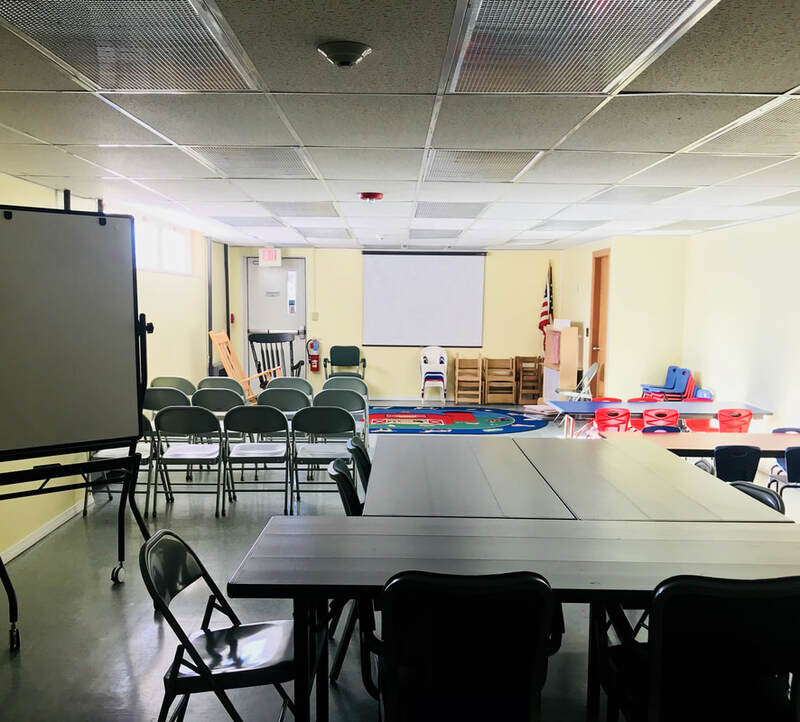 Our Caribou Room is equipped with folding chairs, Various size tables, projection screen, a large dry erase board, Wi-Fi capability and access to an Ethernet port. We also have available an overhead projector and external speakers (see rental fees). We encourage the use of this room by the community. Let us help you with your event. For any public nonprofit organized group may apply for the use of the Caribou Room. The room may also be reserved by local businesses for meetings or conferences. See Fee schedule. Homeschoolers are encouraged to use the Caribou Room for classroom space and events. See Homeschool fee schedule. The Caribou Room is available for meetings Monday through Thursday from 10 AM to 7PM, Friday 10AM to 6 PM, and Saturday from 10AM to 2PM during winter/fall/spring. Although we discourage use of Caribou Room outside our working hours, from time to time we may make arrangements. This is only done by the explicit permission of the Director. All meetings shall be scheduled a least one week in advance of the requested date with the library. No smoking or alcoholic beverages are allowed in or outside the library. As the Caribou Room is located where noise and physical activity could interfere with the primary functions of the library, we ask that the Caribou Room door be closed during programs in which activities may create noise. Misuse of the Caribou Room or infractions of rules as previously stated will result in voiding permission for further use by such organization. No fee for a group that uses the room for free community programs or informational sessions. For workshops or business meetings, the fee is very reasonable.